Well, what did you all think? Leave a link below to your blog post if you wrote about this week’s recipe, or just leave a comment and let the group know what you thought! I’m headed out of town and didn’t have time to write a blog post, but I wanted to give my thoughts. I loved this recipe! It was fun to try something with a bit of a “twist”. I ended up using boneless thighs (my new favorite stir-fry meat) and everything turned out fantastically. I’ve been experimenting with fried rice lately, and this is definitely going to become a regular in my fried rice rotation. Loved making this. May try Matt’s suggestion of boneless thighs – it would be easier to cut, just as juicy as leg meat and should pick up the marinade just as well as the drumsticks. Grace – was their any particular reason you specified drumsticks, rather than just dark meat? Thanks for the great posts from everyone. Rob, I love that you’re using the traditional Chinese cast-iron wok over charcoal. 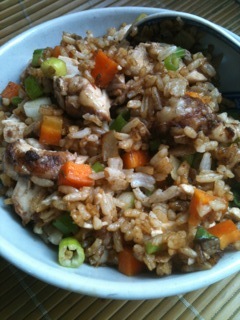 I agree with your wife that an egg or 2 would be a smart addition to the jerk chicken fried rice. The brilliance of a diaspora stir-fry is that it inspires improvisation. And Laura, I think boneless chicken thighs is a good idea. The only problem is most boneless thighs are also skinless and I think a little of the caramelized skin makes the rice extra yummy. Looks like I forgot to post this one. Delicious dish, I too uses thighs only because I had some already prepared in the freezer. My husband is not crazy about the flavor that allspice adds to a dish so I went with 1 tsp instead of 2. I think the best thing about all of these recipes is that once you buy the ingredients you have everything you need to do most all of the recipes. Love the cookbook every time I crack it open. Thanks G.